This is multi zone Indirect fired biscuit Oven suitable for general purpose biscuit baking.This Oven is divided into several independent heating zones along the Chamber.Each zone includes compulsory hot wind circulation system comprising a Combustion Chamber with Burner, Circulating fan, Turbulence fan, and the associated Duct work leading the banks of Radiator tubes.The oven identified by Technology Council, specialists consistently cognizance that is has reached the International level. 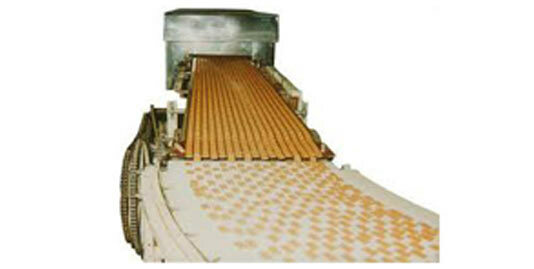 It can meet the technological requirements for production of different biscuits. The machine is heated with gas (LPG or natural gas) or Oil (Diesel / Furnace Oil) Fired imported Burners which gives rapid heating up, high efficiency and energy saving . The oven is divided into independent heat control zones whose number depends upon the overall length of the oven. 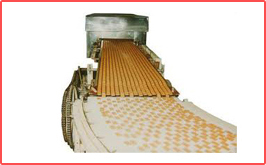 The top and bottom temperature of each zone can be preset and adjusted to reach heating demand of baking different biscuit.The colour, scent and taste of biscuits is overall improved to a higher grade.